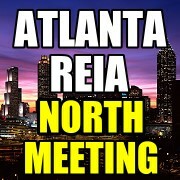 At our August Atlanta REIA Main Monthly Meeting, Dustin Griffin he is starting a new “Atlanta REIA North” subchapter meeting being held at 6:00 PM to 8:00 PM on the third Tuesday of each month at his office located at 1960 Skylar Hill Dr, Suite D, Buford, Georgia in North Gwinnett County a few miles from the Mall of Georgia. Like the Main Atlanta REIA Monthly Meeting, this subgroup will be led by Dustin Griffin and Gordon Catts and will focus on a wide variety of real estate investing strategies with a special emphasis on Internet Marketing and Technology for the modern day “High Tech Investor”. Immediately following the Atlanta REIA North Monthly Meeting, we will reconvene at the Mall of Georgia Taco Mac for Late Nite Networking North. We hope you will come out and eat, drink, network, learn and have fun with us! The Atlanta REIA North meeting place is better equipped for classroom style trainings and workshop and has Internet access, two large 8ft whiteboards, an 8 foot projector screen, a permanently ceiling-mounted video projector, an LCD overhead projector as well as an old school, traditional transparency style projector. Be sure to bring your portable computer so you can get online if needed. In addition to our Atlanta REIA North Monthly Meetings, many of our educational real estate seminars and workshops will be held here in the near future. Be sure to see our Events Calendar for our latest real estate meetings, networking events, seminars and workshops.